This my first participation in BBD because AP269 the host of this month's challenge invited me and also I love to bake all sorts of breads. Here is a link to AP269 blog site Family & Food & Other things about this month's challenge. Well looking at the theme of this month's challenge Italian Breads the first thing that came to mind was my “Banquet Focaccia” this is a bread that I make to feed hordes of people at parties, BBQs and family gatherings. It is very rich in olive oil and includes fine 'dust' polenta for crispiness and crunch and is stuffed to the gills with Italian delicacies such as spicy Italian sausage, olives and rosemary with sea-salt. The bread starts with a sponge that is made the night before, then fine ('dust') polenta (cornmeal)is added with some additional flour to make up the final dough this is allowed to rise then punched-down twice, then the stuffings are added and then after a final rising it is baked in a very hot oven until it is golden. This focaccia is unusual in that it stores well for a day and slices of the day-old bread toast with a superb crisp crust under the griller (broiler) this is because the polenta traps the moisture so delaying the staling process. Makes one 33cmx24cmx2½cm or 13"x9½"x1" focaccia. Serves 20 as an entrée. The recipe produces a rustic tasting bread that has a lovely texture and since we use a sponge to make the dough the final bread has a great depth of flavour. This focaccia has a hydration ratio of about 95% to 105% (the normal focaccia ratio is about 70-80%) this is because the cornmeal (polenta) absorbs and locks in a lot of the excess moisture. 1/8 teaspoon (4 pinches) of yeast. 1. Making the sponge - in the late afternoon place in a large bowl the sponge ingredients mix using a whisk leave overnight, the next day you will have a light spongy batter that has risen about 2-3 times. The sponge should have a pleasant sour yeast smell. 2. Making the dough - Add 3/4 cup of flour and the polenta to the sponge mix using a whisk to form a very loose wet 'dough' (like a very thick semi-solid batter), add oil in small amounts on your hands and using a plastic scrapper 'knead' the dough for about 8 mins adding all the oil in small amounts to the dough during this time, don't worry it is a very slack sticky loose wet 'batter-dough' it should just hold its shape and slowly fall (you can add more oil if needed to get the right consistency try to avoid adding more flour unless the dough really is like a batter). You are trying to incorporate the maximum amount of liquid and still have a workable focaccia dough. This consistency allows many large and small bubbles to form in the final bread. If you don't have a plastic scraper use your hands but kneading the dough will be a messy job and it will stick to the counter. (You can use a mixing machine with a dough hook watch carefully the dough will travel up the hook and could be thrown out of the mixing bowl!) I have made this recipe over the course of a year and sometimes I have needed to add up to ½ cup of extra plain flour to get the correct consistency. A test for the correct consistency is to rapidly whisk the batter-dough and if most of the mixture forms a ball on the whisk it is done. Another sign is that the edges of the batter-dough start to form stings when you are kneading the mixture. The final batter-dough is wet, slightly sticky and will fall slowly and if you use a tablespoon to make a furrow in the mixture it should fill in a few seconds. 3. Return to bowl let raise until doubled in height about 3 hrs (might take 5 hrs) depends on temperature and how active your yeast is. 4. Spread 2 tablespoons of olive oil over the base of a focaccia pan (33cmx24cmx2½cm or 13"x9½"x1" or use a 1" deep jelly slice pan. Gently spread the dough evenly over the pan. Let raise again until doubled in height. 5. Using oiled fingers "punch-down" the dough releasing most of the trapped gases in the dough leave some scattered areas untouched. 6. Let raise again the dough will now be full of little and big bubbles. 7. Using oiled fingers poke stuffed-olives into one-third of the dough and rosemary sprigs into another one-third and the last one-third spicy Italian sausage by forming a dimple first and then placing the ingredient in the dimple. Let rise again about 30 mins (or until dough between dimples is well risen and has large bubbles) place a small amount of oil in each dimple of the foccacia and sea-salt flakes on the rosemary one-third of the focaccia. 8. Pre-heat oven 260ºC/500ºF place focaccia into oven bake for 5 mins (this ensures the olives will be baked and sausage will be crisp) then turn down the temperature to 220ºC/425ºF then bake for an extra 20-30 mins (the more fillings you stuff into the dough the longer it takes so the focaccia above was 35mins total baking time since it was totally full of olives and sausage)until top is golden brown and the base crispy. The sides of the focaccia should have pulled away from the sides of the baking pan. Check the crispiness of the bottom by gently lifting the focaccia using the flat side of a wide knife to see the colour of the bottom, feel the bottom it should be crisp and firm. 9. Optional step - Once baked you can brush extra olive oil onto the top of the baked focaccia which adds gleam and softens the crust which is a great contrast to crisp bottom. Cool the focaccia in the pan for 5 mins then turn out. Serve warm. Store this bread overnight on the counter wrapped in foil and plastic and when you get to the event slice into 60 slices and toast for 30 secs each side (only top and bottom) under a hot griller (broiler) until warmed and crisp. Yum yum! 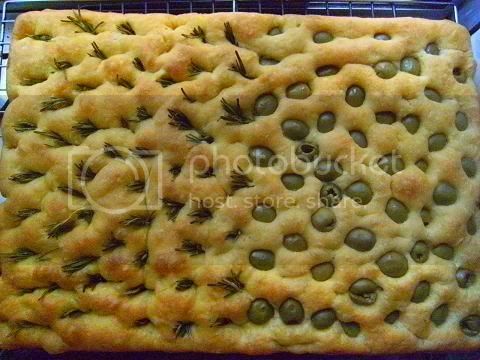 Here is another banquet focaccia I did a little while ago just using olives and rosemary/sea salt. If you desire a more traditional focaccia just dimple the dough fill each dimple with olive oil and spread the top with lightly chopped rosemary and seasalt. I have submitted this to Susan's Yeastspotting site also see here. Hi Audax! Love your foccacia! I've been wanting to try this since that day you made it while waiting for your British pudding to cook! Looks really amazing!! And now with sausages... OMG, it must be delicious! Mmmm, great foccacia! I'll be making this one very soon. If I get time I'd love to participate in the Bread Baking Day. looks great! Not an olive person myself but the herbed side looks so good. Wow, that bread looks amazing! Love it. This looks so good. 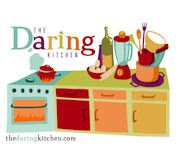 I am interested in doing some small home catering and I can see this being a hit. Hello! That looks AMAZING! I love focaccia! Delicious! I should blow up the first picture into a poster and give it to my middle child - he LOVES olives and especially olive bread! I haven't tried focaccia yet, so this looks divine! Your Foccacia looks so delicious! I enjoy everything you do as it always looks stunning, very professional even. Also stopped to say ~ Thank you for commenting at my blog and for you encouraging words ♥. Wow Audax, the foccacia looks incredible! I love the colors on top. Thank you for visiting my blog. Glad you liked my recipes. Loved the results of your DC challenge as well. Wow! theses breads are really looking good! Thanks for your comment on my blog, I really appreciate it! This bread truly is fabulous! I love all the different flavors you have combined. OMG - these breads are works of art. I especially like the cross section of the olive. Mmmm! Cheers! Audax, I love the colorfulness of your focaccia! Great job! And thanks for participating in BBD! Incredibly lovely focaccia! Thank you for joining Yeastpotting! Oh, what a beautiful loaf of foccacia!! I love how you varied the toppings...absolutely gorgeous! Looks amazing! Thank you for participating in BBD, perhaps you would like to join us this month, too?